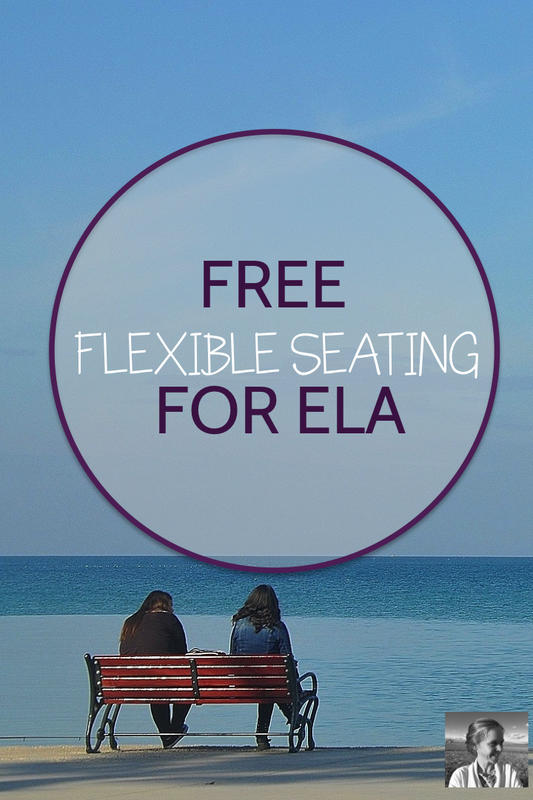 Flexible seating seems to be all the rage, and I can understand why. 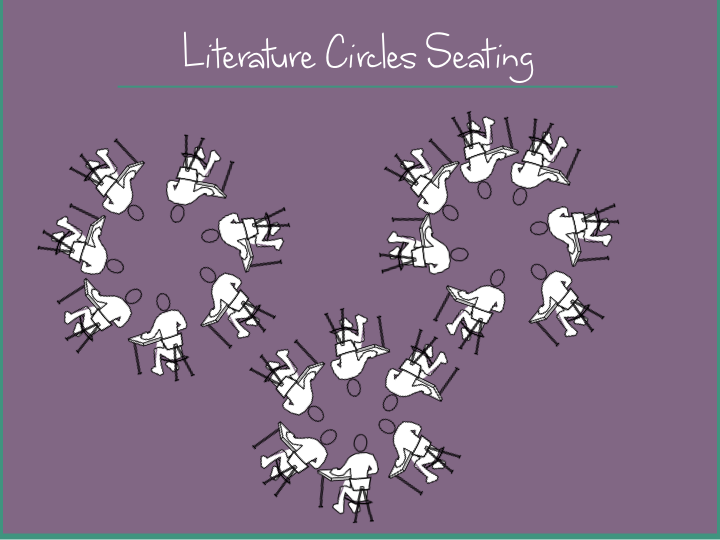 Who wouldn't want a classroom that can turn into a cozy coffee shop, a writer's workshop, a reading lounge, or a stage with comfortable seating for the viewers? 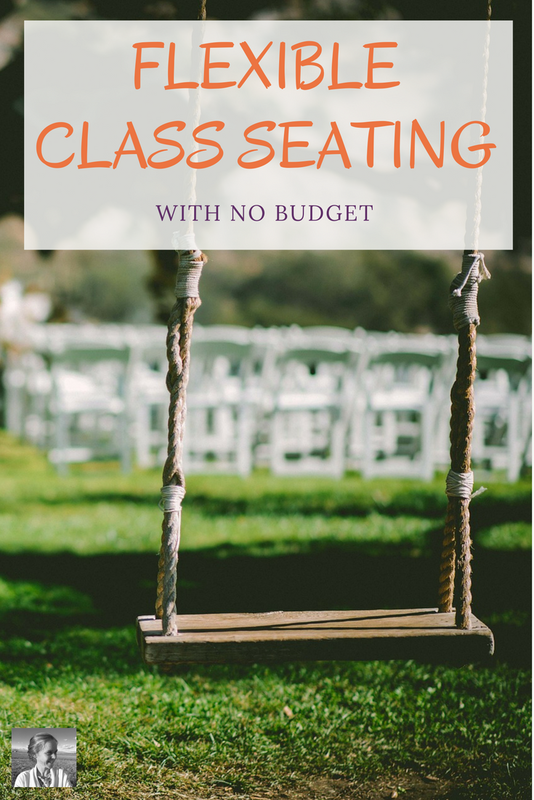 I've never really had a classroom budget. Once I got a grant to develop a theater corner, which was so much fun! Once, I asked my department chair for some money to get art supplies, and she said yes. But other than that, I've never really leaned back in my desk chair thinking "hmmm, how am I going to spend all my money this year?!" Can you relate? Even if you have a budget, you probably spend it on office supplies. Maybe a few fun treats for holidays or standardized testing. For most of us, couches, cereal bowl chairs and beanbags just aren't on the list. But that's never stopped me from keeping my seating flexible. When I first started teaching, my flexible seating came from my own sweat. Between different types of classes I would simply charge around the room pushing desks right and left until I had produced the perfect arrangement for what I had in mind. But it was a bit difficult. Especially when I was pregnant! Luckily, students arriving early or staying late always seemed willing to lend a hand. "How do you want them?" they would ask. And I would explain my plan. Finally, I decided to make the process a bit simpler. 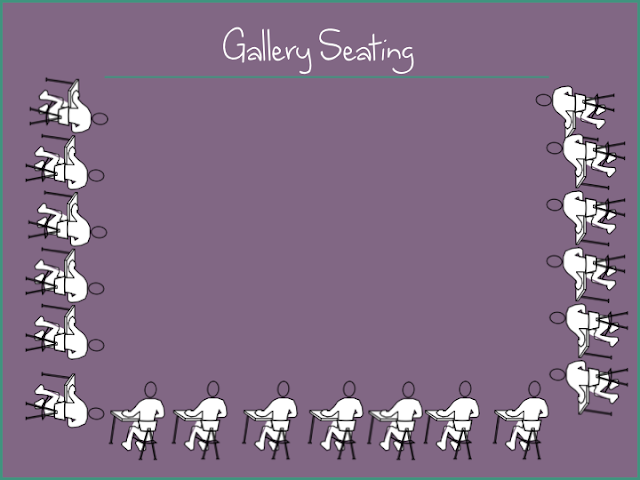 I have created seating charts I can project that show the seating plan for the day. As students walk in before the bell, I can just ask them to help me move the desks into position for whatever creative work we have in store. Here are the seating layouts I use most often. At the end of this post, you'll find a link to go download these charts for yourself, in case you, like me, could use some free flexible seating without too much sweat! Literature Circles Seating: perfect for literature circles, just have students set up circles for however many different books they are studying. 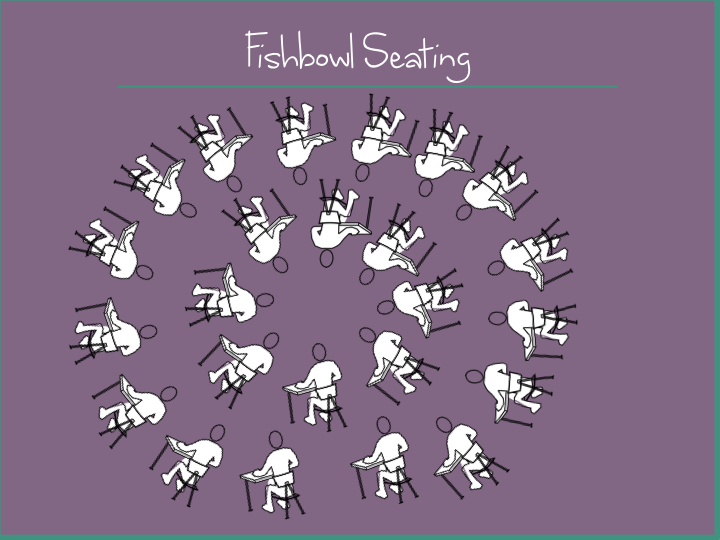 Fishbowl Seating: for fishbowl discussions, in which the inner circle discusses as the outer circle observes. Never tried them? This video lays out the basic idea well. 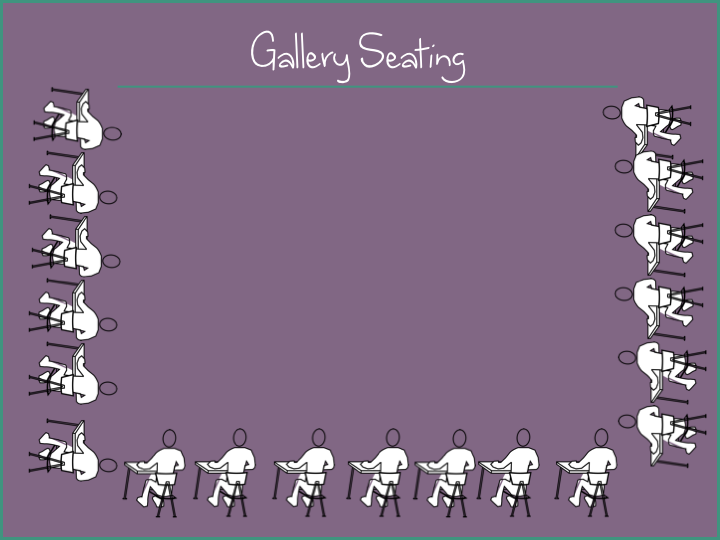 Gallery Seating: good for a range of class activities. I like to have students put their final projects and papers out on their desks in gallery seating and have everyone walk around the space reading and looking over each other’s final work so they have a wider authentic audience. It’s also great for watching movies or scene performances, or listening to speeches or presentations. 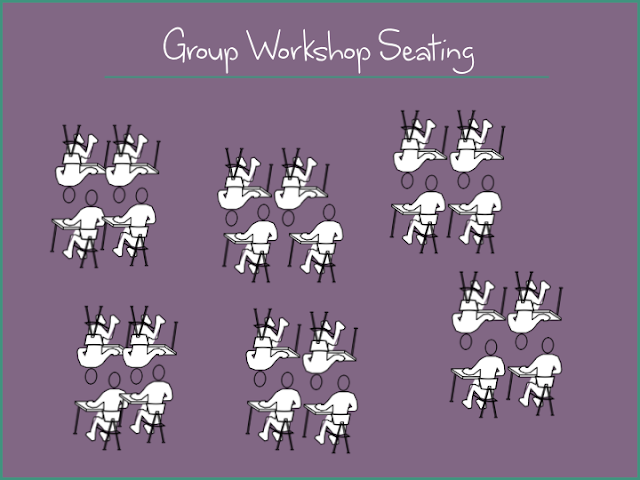 Group Workshop Seating: nice for small group work, writing workshop in which students are editing each other’s work, etc. Simply take over one island of seats if you’d like to run your own station and work with several students individually. You can find all these charts in a free PDF over at my store on Teachers Pay Teachers. You'll also find creative resources that will enable you to stretch and engage your students without breaking the bank for new technology or millions of art supplies. I hope you decide to get flexible this year! And hey, if you've got the budget, throw in a couch as well. But if not, you can still borrow a focus from Google and keep your space flexible and creative. 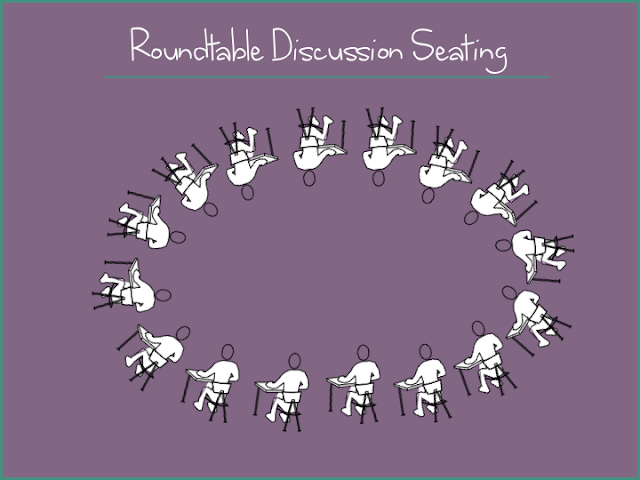 Looking for collaboration and support in your creative teaching journey? Pop into our Facebook group, Creative High School English.